(KERI) I was in New York City this past week with my friend and colleague, Jim. We were working with cool client Lincoln Center, and Jim had done all of the heavy lifting on the project. (Boy, was the work GOO-OOD.) I wanted to treat him with a trip to one of my favorite NYC eateries, Bobby Flay’s Bar Americain. Jim wasn’t sayin’ ‘no.’ I promised it was worth staying out a little while longer the night before our big presentation. Mr. Flay has an uncanny and unmatched ability to create the most perfect depth of flavors, then combine so many of them into one dish that you’re left a little dumb-founded: How does he do that? He’s Bobby, that’s how. Jim and I perused the menu and both got stuck on one dish: Red Snapper Florida Style. Florida style? What the heck was Florida style? We inquired and our experienced waitress smiled as she rattled off the ingredients, with elegant staccato: plantain-encrusted snapper, black bean puree with chipotle peppers, avocado-mango salsa with cilantro and lime, all bedazzled with a roasted jalapeno crema. We couldn’t speak. Our eyes grew bigger with every ingredient she uttered. Pow. Pow. Pow. Jim’s eye wandered, though. He was smitten with the pork chop topped with a quail egg. I couldn’t blame him. The snapper called me, though. I ran into its open arms. And when I returned home, it’s all I could think about (yes, I mean that), it’s all I could talk about (Marina kept saying, ‘Yes, Mom, we KNOW the fish was all that! Make it already!). And I found the recipe online! This love was meant to be. You gotta layer up the flavors, just like Bobby. 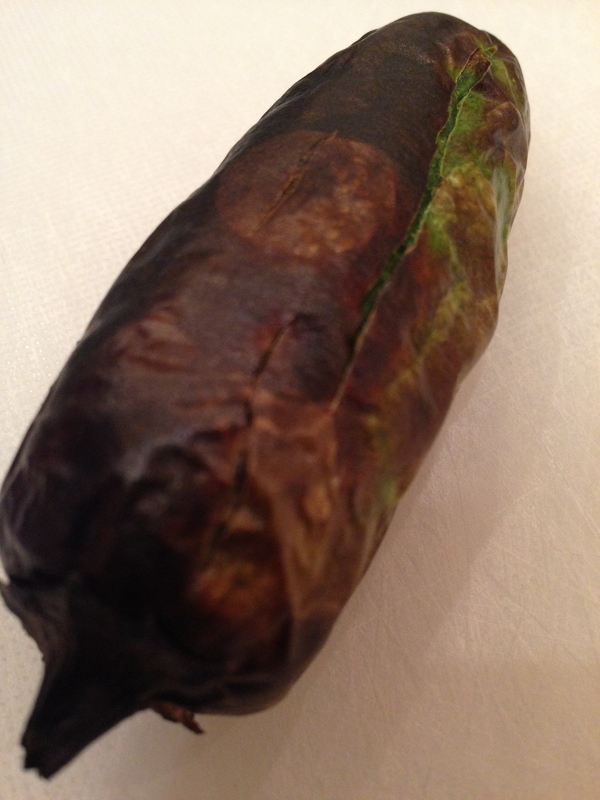 Start with the crema – I broiled the jalapeno for about three minutes then turned it and broiled it for another three or four minutes until it was nicely charred. After it’s peeled and seeded, you just blend it up with sour cream, salt, and pepper. Step one: DONE. Next up, that luscious salsa. Mango meets avocado and red onion in a pool of lime juice, honey, and canola oil. A sprinkling of cilantro, then let it all hang out for 10-20 minutes. This salsa could easily pair up with chicken, pork, or even a filet. Beautiful. For the black bean puree, I went for canned beans vs. the dry beans Bobby calls for. It doesn’t matter, truly. I did cook them on the stovetop with the onions, garlic, chipotles, and cumin, as directed. With canned beans, cook at a low temperature for about 15 minutes, stirring often. Puree away in a blender (I added a little water to loosen it up). Then there’s the fish. I called several local grocery stores to find red snapper and a Whole Food monger told me, ‘we don’t carry it because it’s not easily caught in a sustainable way.’ Oh no. A little research told me red snapper is on the ‘fish watch list.’ Dang it. But okay, the monger told me there were several great substitutes. I chose halibut and wasn’t the least bit sorry. When I had this dish at Bar Americain, I could have sworn the fish was crusted with very thin potatoes (and apparently in my dazed state, I didn’t hear the waitress say ‘plantains’). 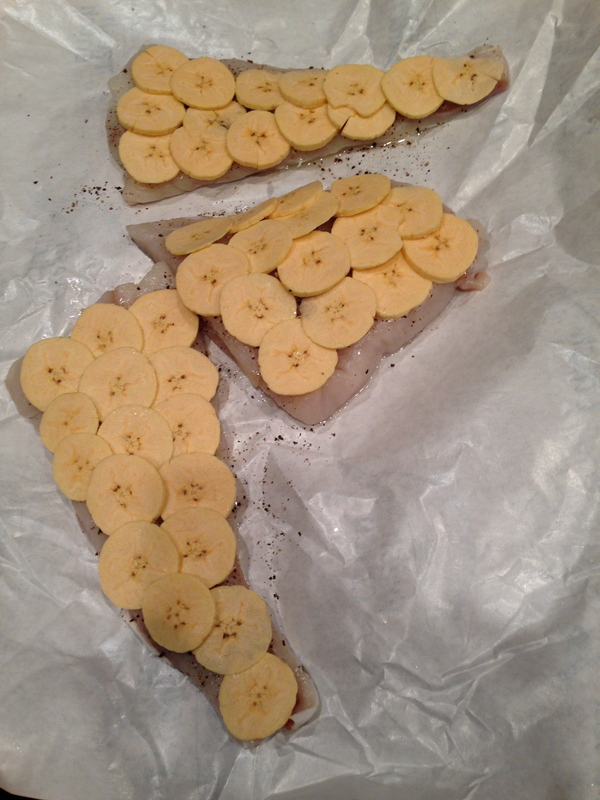 Oh, the mimic of fish scales with paper-thin plantain slices is such a perfect touch, there are no words. They’re starchy and get almost caramelized when you fry the fish in a hot pan. Here they are before the cooking, all dressed up and ready for a hot night. Stunning, People. I won’t say it’s easy to get those babies into the pan without a fair amount of weird contortion in attempt to keep the plantains intact. Just do the best you can. Or enlist the help of your Daddy Bite, as I did. Put it all together and OH MY BOBBY FLAY. This is the best fish I have ever eaten. Remember I don’t say these things unless 100% true. That flavor layer Bobby is famous for plays out with spectacular success. NYC is always fun, but you don’t need to make the trek east to have this singular sensation. What a mind-blowing dinner. Jim and I head to Beantown this week for another business trip, and maybe another culinary inspiration. For the salsa, whisk together the lime juice, oil, honey, salt and pepper in a medium bowl. 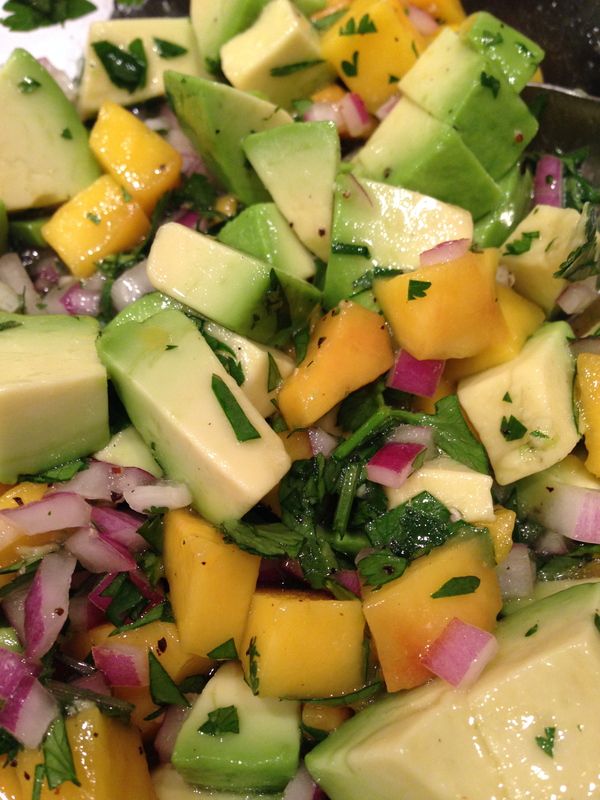 Add the avocado, mango, red onion and cilantro, and gently mix to combine. Let rest for 30 minutes. 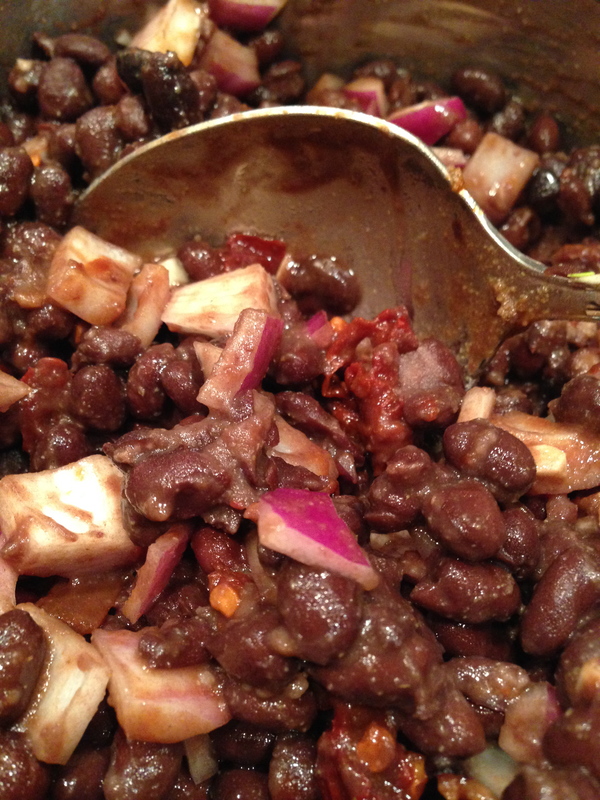 For the black bean sauce, combine beans, onion, garlic, chipotle and cumin in a medium saucepan. Bring to a simmer and continue to simmer for 15-20 minutes, stirring often. Transfer mixture to a food processor with a slotted spoon, add about 1/2 cup of water and process until almost smooth; the sauce should be a little chunky. If the sauce is too thick, thin with a little cooking water. Season with salt. For the crema, combine sour cream and jalapeno in a food processor and process until smooth. Season with salt and pepper, and refrigerate for at least 30 minutes before serving. Brush the fish with oil on the non-skin side and season with salt and pepper. 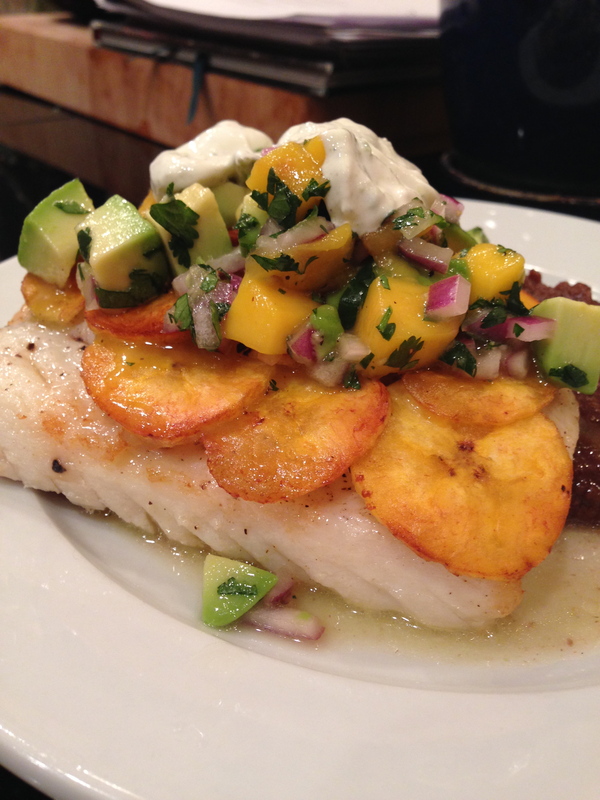 Cover the surface of the fish with the plantains, overlapping them to make scales. Brush the top with oil and season with salt and pepper. Heat 2-3 tablespoons of canola oil in a large nonstick pan over medium-high heat and carefully place the fish in the pan, plantain side down. Cook until the crust is lightly golden brown, about 4 minutes. Turn the fish over and continue cooking until just cooked through, about 3-4 minutes longer. Spoon some of the black bean sauce onto 4 plates and drizzle with some of the jalapeno crema. Set the snapper, plantain side up, on top. 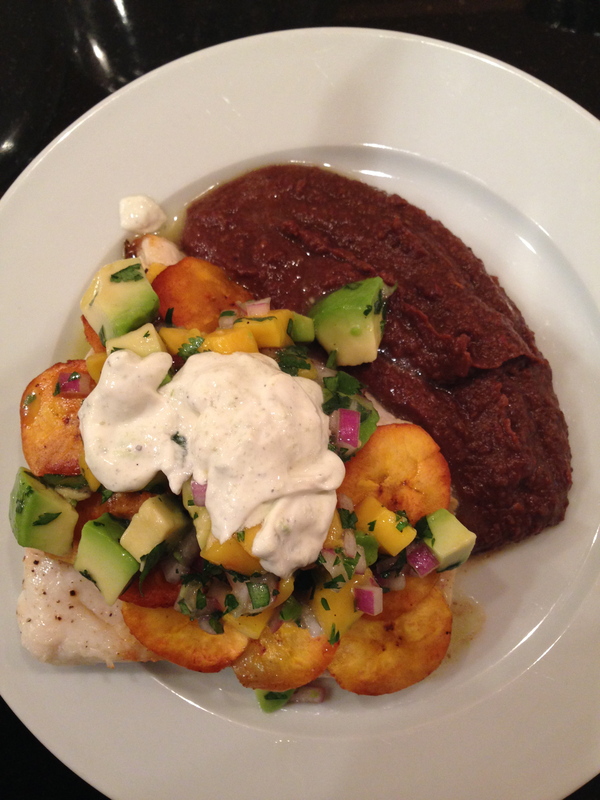 Spoon some mango-avocado relish next to the fish and serve. This entry was posted in Fish, Main Dishes. Bookmark the permalink.